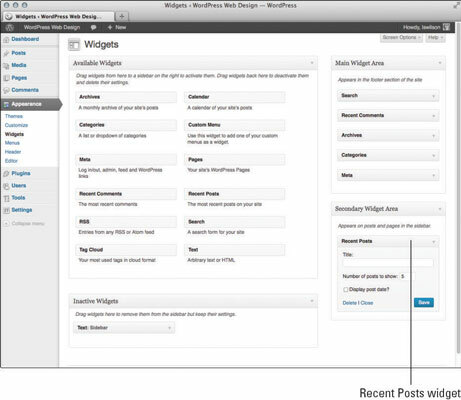 The left side of the Widgets page lists all the available widgets for your WordPress site. The right side of the page lists the widget areas designated in your theme. Drag your selected widget from the left side of the page into your chosen widget area on the right. For example, to add a search box to the right sidebar of the default layout of the Twenty Thirteen theme, drag the Search widget from the Available Widgets section to the Secondary Widget Area. 1Choose Appearance→Widgets from the Dashboard. 2Decide which widget you want to use from the Available Widgets section. 3Click the widget title and then drag and drop the widget into the Main Widget Area or Secondary Widget Area on the right side of the page. Drag the Recent Posts widget to the Secondary Widget Area. 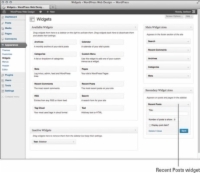 4Configure options for the widget as desired and then click Save. Each widget has different options that you can configure. Some widgets have a number of editable options; others simply let you write a title for the widget area. The Recent Posts widget has two options: one for editing the title and one to determine how many recent posts to display. Open the widget, by clicking the arrow to the right of the widget title, to explore the options available. 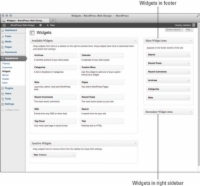 Repeat Steps 1 through 4 to add more widgets to your layout. 5Arrange your widgets in the order you want them to appear on your site by clicking a widget and dragging it above or below another widget. Repeat this step until your widgets are arranged the way you want them. 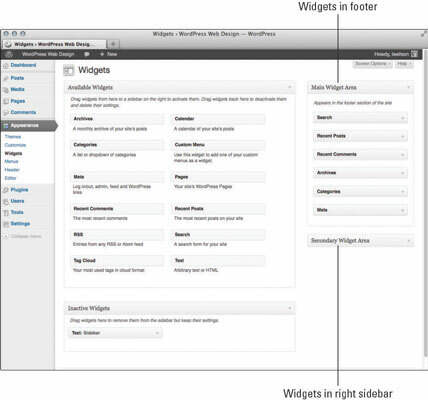 After you select and configure all your widgets, visit your website in your web browser and you can see that your site’s sidebar matches the content (in the proper order) you’ve arranged in the Main Widget Area and Secondary Widget Area on the Widgets page on your Dashboard. How cool is that? You can go back to the Widgets page and rearrange, add, or remove items to your heart’s content.